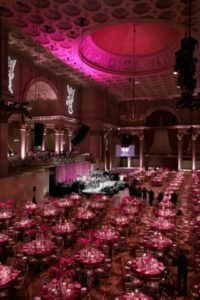 The signature fundraising event of Gabrielle’s Angel Foundation, the Angel Ball stands out as one of the highlights of the New York social season. This star-studded event, known for its amazing live entertainment and celebrity participants, honors those outstanding individuals who have made significant humanitarian and philanthropic contributions in support of cancer research. The Angel Ball boasts 900 high net-worth attendees all leaders in the fields of business, philanthropy, and society alike at this annual celebration of life, music and our quest for a cure. Bermuda Limousine International has been chosen to be the official transportation company under the direction of Billy Amato, CMP/logistic specialist.